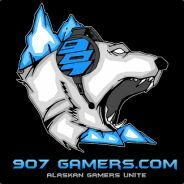 This is only a Steam group that is part of the 907 Gamers Network. We have a Facebook Group, Twitch.TV Team, Discord, YouTube Channel and Twitter account. Join our subgroup for Player Unknown Battleground! Team 907 Gamers presented with The Children's Hospital at Providence a giant 24 Hour Gaming Marathon for charity. We locked in the Alaska Airlines Center for 24 Hours! We recruited an army of gamers to attend our free event and play videogames for 24 Hours straight (or until you get burned out). We provided the tables, chairs, internet and power. You brought your favorite gaming system and hooked it up. Hundreds of gamers joined in a giant social gaming marathon where all proceeds went to a good cause! looking for people to play some cs:go w before i leave state for a bit, cas & comp. Hey everyone! Been living in Alaska since I was 5. Just started streaming, and would love to get together with some of you guys and play some competitive FPS. I’m currently playing Insurgency Sandstorm. Thanks. @Spartan...I'm working on my YT for the last 2 years. Hit me up if you'd like to co-lab sometime. Search for SIERRASQUARED on YT. Love to have you.